There are so many reasons that I love my friends but one of them has to be that they are totally willing to entertain going to different places to eat and accepting I will whack my camera out as soon as food arrives. 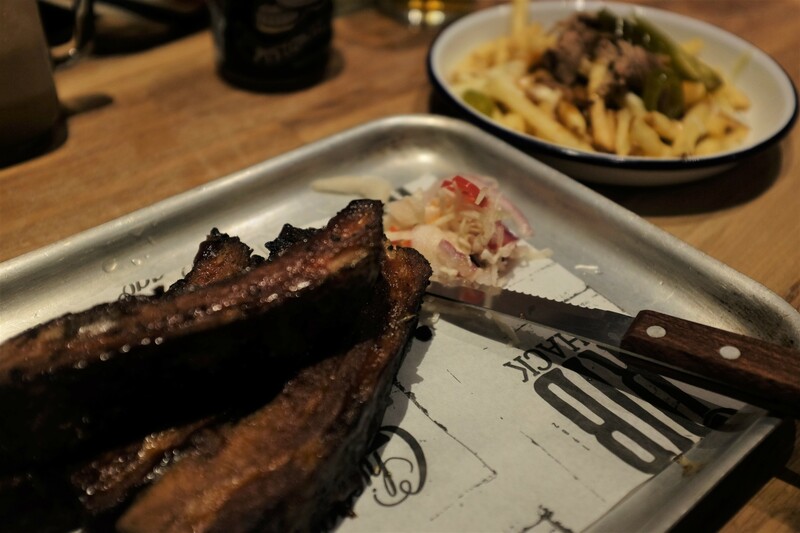 So when Chicago Rib Shack opened up in Boxpark, Croydon and they agreed it sounded like it was worth a visit that was it – the plan was made and actioned swiftly. We had wanted to visit it a few days earlier than we did though as they were doing ribs for 1p and each person could get two to three ribs but the times of the offer meant it would have only been possible if we were all on lunch break from one of the offices moments away and also the photos of queues looked ridiculous. 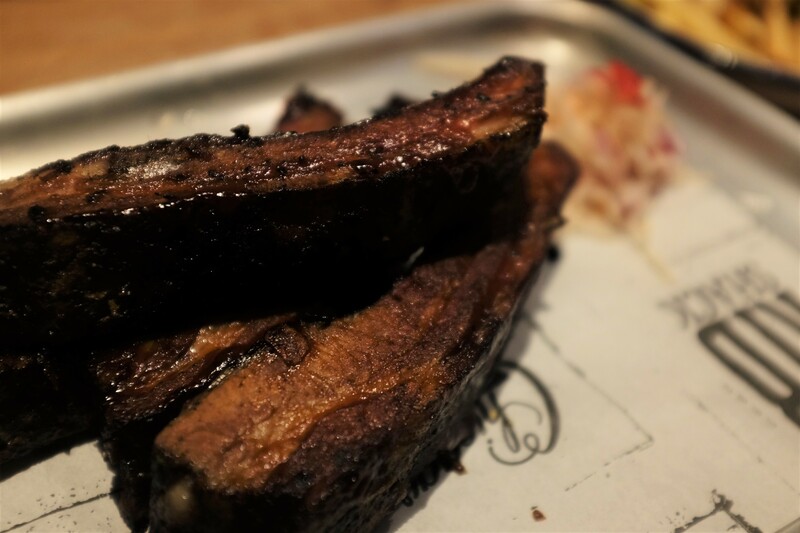 The ribs would have almost certainly been individual ones from smaller racks as well so we decided to give the full menu and the beasty ribs on offer a try. The day we visited was probably the busiest that we have seen Boxpark in a long time and with groups split awkwardly over the benches in the main area we had no choice but to squeeze onto a bench at the back of one of their shipping containers and shout along the bench like an assembly line. Despite the seating arrangement being a little difficult to negotiate, especially as the last person to sit down or the first one to attempt to leave, there actually seemed to be more space in front of us than on some of the tables that had six people crammed onto the benches and that meant we were not banging elbows when tackling the ribs. With an attempt to drink less alcohol, especially if it is just a casual afternoon with no real particular occasion attached to it, and a love of ice cream floats or super loaded shakes there was little to deliberate when taking a look at the list of drinks on offer. Not only did they have a soda float but they had a cherry soda that was topped with vanilla ice cream which sounded fantastic but unfortunately it was rather poorly executed. The ribs themselves were balanced in terms of flavour thanks to the sauce they used to glaze it and with the mild smoking of the ribs. Unlike ‘traditional’ rib shacks there was no space for a big hefty oven to put the ribs into and this was obvious with the smoky flavours coming through so gently; the ribs themselves could certainly have taken another whack or two of heat. In terms of the meat quality and the way it had been cooked it was nothing special. The ribs were tender but certainly not fall off the bone or melt in your mouth on eating them and the meat itself, when breaking through the outer layer of seasoning, was not that juicy succulent meaty flavours you might expect. The ribs felt pretty mediocre and like they either needed more technique and smoke infused cooking or a better quality of rib to handle their slap dash approach. As for the dirty fries, these are loaded with meat and some sauce, they again just missed the spot of perfection. The chips were never golden and crispy on the outside before the toppings landed which made for a disappointing bite. That combined with the toppings that lacked in depth of flavour, quantity or adding any value to the dish really made them some of the more disappointing fries I have had from an eating establishment for some time. For the price, this really wasn’t that fantastic. The ribs were okay, the staff were not overly attentive and the side of fries and drink were fairly disappointing. It was the company that made this meal an enjoyable experience rather than anything else. This entry was posted in Food and Drink, Restaurant Reviews and tagged Boxpark Croydon, Chicago rib shack, Chicago ribs, croydon, dinner, dinner out, eat, eating, food, food blog, food blogger, food bloggers, food with friends, friends, lblog, lblogger, lbloggers, life, Lifestyle, lifestyle blog, lifestyle blogger, lifestyle bloggers, lunch, meal out, meat, new restaurant, restaurant, Restaurant review, review, ribs, soda. Bookmark the permalink.